Description: green white red with Savoy arms. The Italian tricolour was and is in the 2:3 ratio. The example in CISV web page <www.cisv.it> showing tricolour with the Shield of the House in square format is a military colour, which was almost square in shape for horse mounted troops. 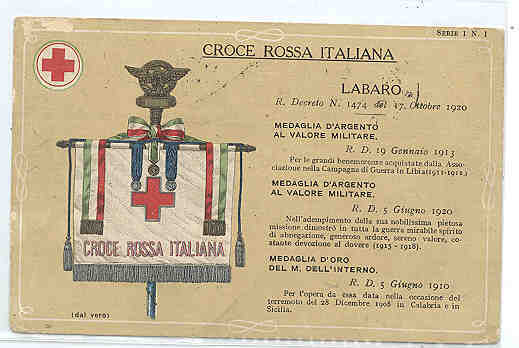 I recently landed on labarum-style flag of the Italian Red Cross, on post card at this website. Apparently introduced 17 Oct. 1920. The postcard itself being from 1929 however, so I am wondering, if the vexillum-style flag shown on the postcard was really introduced in 1920. Perhaps it was only a simpler "gonfalone" introduced in 1920, and either changed later on or just manufactured in a more "elaborate" way.